I’m posting today to share a very important resource with you or someone you love (Mary’s article linked below). I met Mary Goyer, M.S. holistic fertility, pregnancy, and reproductive health specialist when she was speaking a few weeks ago. We immediately connected because our work overlaps. 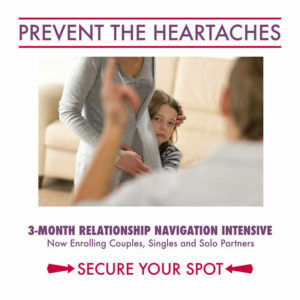 Couples often wait until things have gotten really bad and tried everything that they can think of to save their relationship before reaching out for help. The same holds true for couples experiencing infertility. The experience of wanting a child and not being able to get pregnant is incredibly hard on any couple, and when they don’t get the help they need to deal with their emotions along the way, they risk losing their relationship too. Mary offers safe, natural integrative techniques for women wanting to be mothers. She draws upon her traditional training in marriage & family therapy and her specialty in holistic, mind-body techniques to offer a new way of approaching fertility, birth & wellness for women. Mary supports women/couples who are dealing with a range of challenges: hormonal imbalances, “infertility”, pregnancy loss, relational difficulties, sexual trauma, birth trauma, postpartum depression, anxiety & stress, etc. She works with couples to clear reproductive imbalances, increase fertility, and step into parenthood from a place of connection, confidence, & peace. Her approach, first used to heal herself of cervical cancer, is now offered locally and internationally. Learn more at aufertility.com and auparent.com.